Rail workers, may we have your attention please! 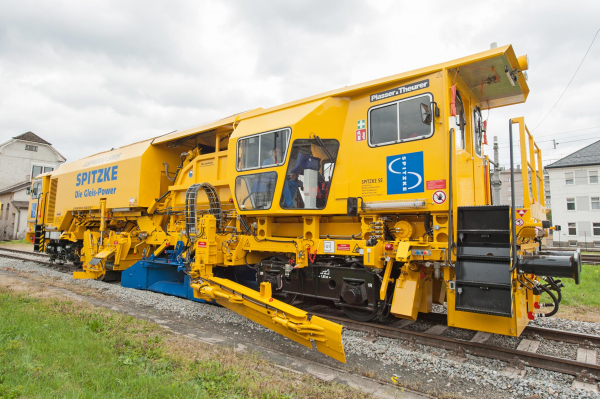 The USP 4000 SWS ballast distributing and profiling machine produces a perfect ballast bed for tracks and turnouts in just one pass. 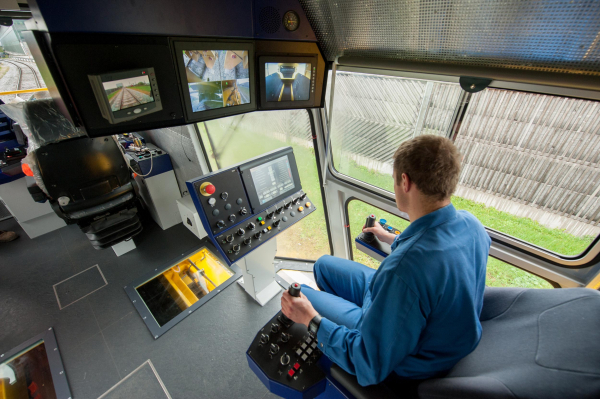 The TSI Noise 2015 (technical specification for interoperability relating to the subsystem rolling stock — noise) stipulates uniform European threshold values for new rail vehicles. The USP 4000 SWS is one of the first machines to meet these requirements, setting a new standard. 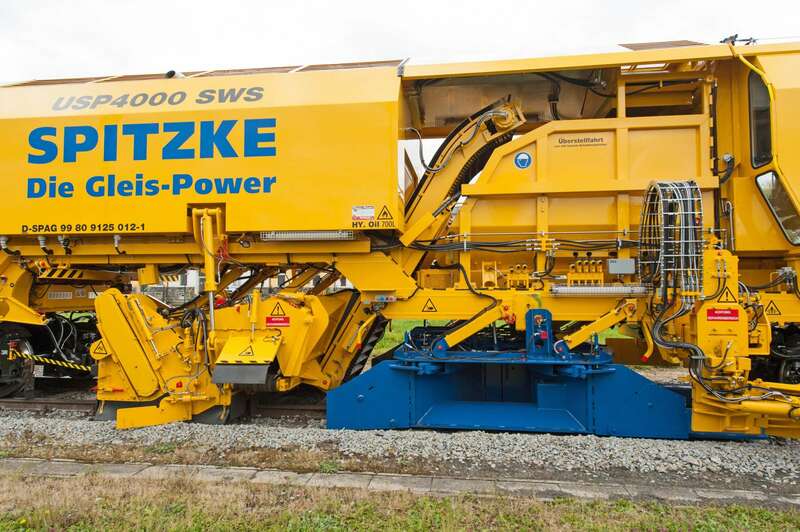 On the USP 4000 SWS, the positioning of all work units enables the technologically correct operation, making it possible to distribute and profile the ballast in one pass. The floor conveyor belt and the distributing chutes in the front part of the machine allow it to be used for spot ballasting as well. 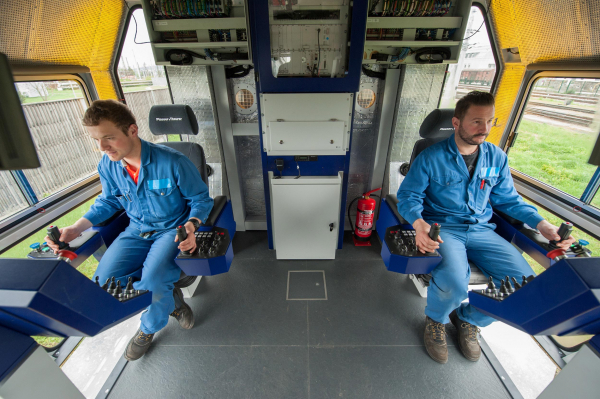 Crucial for all operations, the new machine design with two cabins enables unrestricted UIC visibility in both directions of travel. For transfer, the USP 4000 SWS can now travel in forward and reverse direction, like the BDS ballast management system. When designing the machine, a particular focus was placed on the protection against noise and dust. 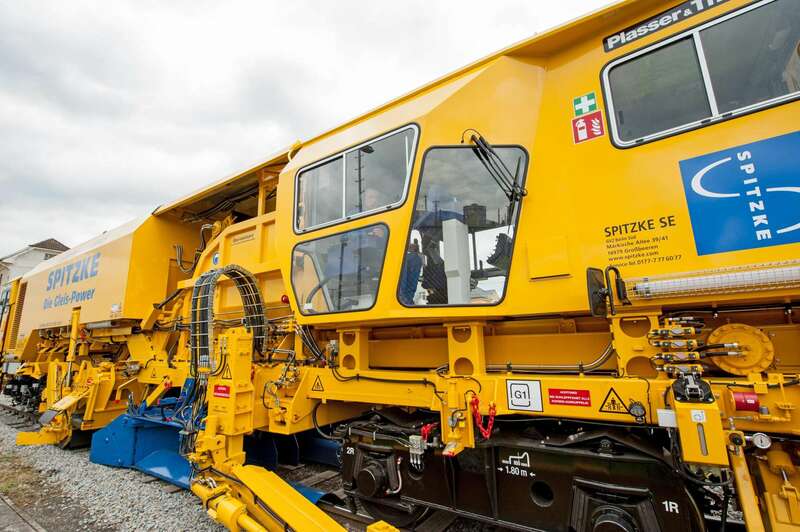 This is why the sweeper unit for tracks and turnouts was fitted with a special rubber lining, reducing both noise and wear. The ballast hopper holds 5 m³ and has been lined with ROBALON plastic sheets. A dust arresting atomiser unit reduces dust emission on the entire work site. The USP 4000 SWS has also been fitted the simple and clearly structured machine control system P-IC Plasser Intelligent Control. When the hopper is empty, the machine meets the requirements for operation on line category C2. At iaf 2017, the new USP 4000 SWS will be handed over to Spitzke, as cutting-edge add-on to the powerful maintenance fleet. When designing the machine, a particular focus was placed on the protection against noise and dust.